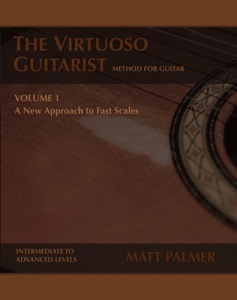 An in-depth guide to Matt Palmer’s groundbreaking approach to playing fast scales on the guitar. This proven and effective A-M-I scale method is specifically designed for speed and efficiency. Includes textual guidelines, figures, exercises, and examples from the standard repertoire. 82 pages. Bound. Standard notation. Intermediate/Advanced levels. "Matt Palmer is one of the most impressive guitar players I've come across. He has developed a very personal right-hand guitar technique using a combination of three fingers for four-note patterns. This technique has been worked by other guitarists in the past but Matt Palmer has taken this possibility to an ultimate level and the result is pure music."